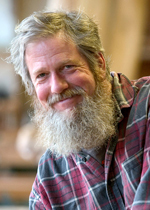 William Hewitt grew up near Boston and came to the Pioneer Valley in the late ’70s to study woodworking at David Powell’s Leeds Design Workshop in Easthampton. He has been creating fine furniture and cabinetry for more than 30 years. 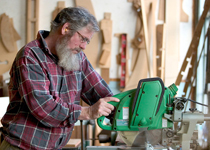 Bill’s woodworking shop is located on the third floor of the One Cottage Street building in Easthampton, MA, where many other artisans have studios for crafts, woodworking, and art businesses. Bill believes that the designing of each piece results in a unique solution. When creating a design, he considers placement (room details, the size of space), usage, and the client’s personal taste, while infusing it with his own style. There is often an architectural influence in his work as well as an emphasis on the selection of wood for beautiful figure and color. Bill also owns the Funny Farm, where he grows organic vegetables and berries on five acres next to the Connecticut river in Whately.